Load up for your next hunt with high-quality Remington® .45-70 Govt. 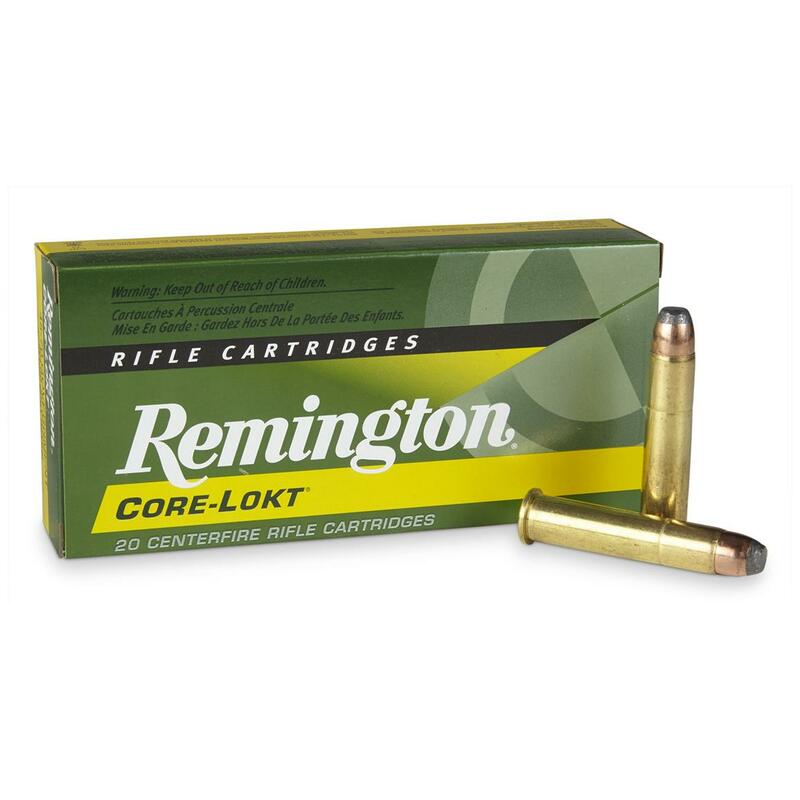 Core-Lokt® Rifle Cartridges, featuring high-grade 70-30 brass cases and Kleanbore® primers. Remington, .45-70 Govt., SP Core-Lokt, 405 Grain, 20 Rounds is rated 4.3 out of 5 by 9. Rated 4 out of 5 by Jeffrey from High Price, Best load This Remington load comes closest to the original loads for a trapdoor Springfield and still keep a jacketed bullet (I worry about leading the barrel). And while the brass is good, I've got an older trapdoor that won't eject it. Looking at four different shells, I noted that three had a groove cut in the casing just above the rim and wouldn't eject. Only Winchester brass had no groove, and my old trapdoor ejected the Winchester every time. Rated 5 out of 5 by Roger D from typical Remington quality ammo This as good shooting ammo for my Marlin 1895 Guide gun topped with a Bushnell 3-4x 40 scope that delivers good groups at 100 yards and even tighter at 50 yards. A consistent performer. I would like to see a lower price tag so I could afford to shoot more. Rated 1 out of 5 by Bill in IL from Weak Sauce Of all of the .45-70 ammo out there, this is by far the weakest of the lot. If you have a modern lever or single shot rifle, stay away from this ammo. There are far, far better choices for less money. And, if you want to spend a little more, Buffalo Bore, Grizzly, Garrett and Hunting Shack make some great .45-70 ammunition. Rated 4 out of 5 by OWEN from Nice ammo. The crimp on the ammo is a little strange though. Very heavy crimp(so heavy that if this was not factory ammo I would have said that it was too heavy). But this is only a cosmetic complaint as the ammo's performance is not effected. Rated 5 out of 5 by TIMOTHY D / DAN from good product, good price. Muzzle Energy : 3,032 ft.-lbs. Superior performance for lever action rifles! Muzzle Energy : 2,198 ft.-lbs.